tape slide down shoulder_blades in back. Meas..
ure over slip or lightweight dress. Measure Waist around smallest part. collar line to de<>ired length. fullest part of chest, l!olding tape snugly. 35- 37..•.....• 22 ...... l 8V2 ... .
Measure Waist just above hip bones at natural"
fully and check with size scales below. 37 to39 .. 23 ..• 22v, ........ .
40 to41 .. 24 ..• 23 ........ .
45 to46 .• 25/i. .• 24 ........ .
47 to49 .. 26 ... 24Y,. ....... .
.. 26V2 ..• 25 .•• 24 ... .
52 to53 •. 27V2 •.• 25V2 .•. 25 ... .
54 to55 .. 28 ..• 26 ... 26 .•..
56 to57 •• 29 ..• 26Y, ..• 27 .•..
to59 •• 29V2 ..• 27 ..• 28 .. ..
60 to61 •• JOV2 ... 27V2 .•• 29 ... .
... 28 ..• 29Y, ..
64 to65 .. 32 ..• 28V2 ••. Jo .•..
65V2to66V2 .. 33 ... 29V2 ..• 31 ; .. .
Tell us your shoe size-length and width-if you know it. , as they sometimes indicate half sizes. the piece of paper as shown. normal spread of foot when standing. the four illustrations at the right. you are ordering, with catalog number noted). edge of the point of the knife. knife is held straight up and down. 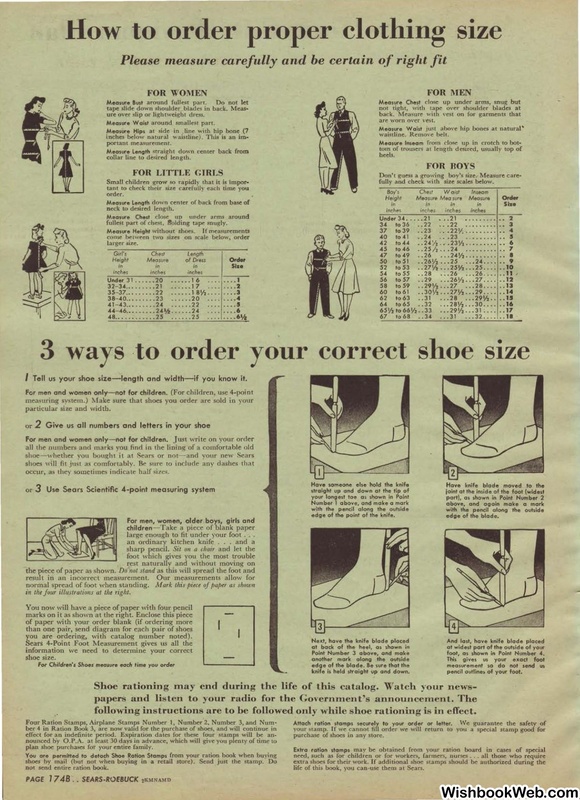 foot, as shown in Point Number 4.
following instructions are to be followed only while shoe rationing is in effect. plan shoe purchases for your entire family. not send entire ration book. purchase of shoes in any store. extra shoes for their work. life of this book, you can-use them at Sears.